Developing skills in organisation, keeping group discussions focused and gaining confidence. 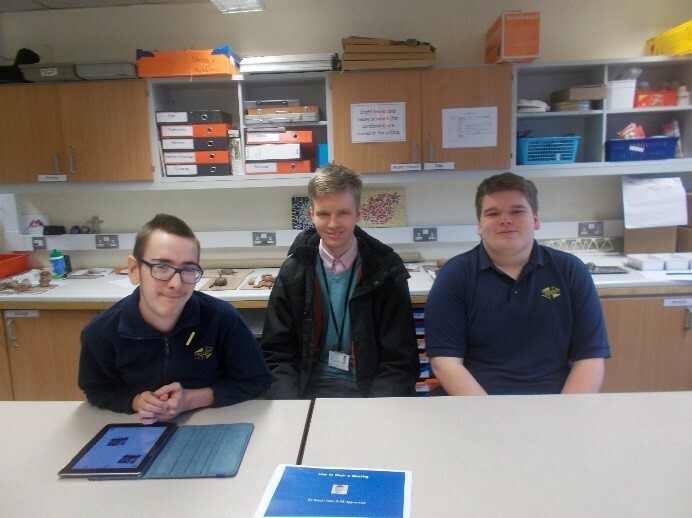 Daniel John, a Participations Apprentice for the Partnership and Commissioning Team at South Gloucestershire Council, lead the training and two students Adam and Daniel rose to the challenge. Before the training there was some apprehension as acting as Chair Person was something so new to them "I don't know a lot about being a Chair Person, if I am organised then I would feel confident" Adam said. Before the meeting commenced, Adam and Daniel decided where to sit and positioned themselves at the head of the table in sight of the clock, to be able to keep an eye on the time so the meeting did not over run. Adam then thought about how to organise their paperwork. "I am going to put them (the paper) in piles. I am running the meeting so I need to be organised" he said. As the meeting began, Adam and Daniel welcomed the attendees and started an ice breaker game which they adapted to fit the group showing great adaptability and flexibility. They chose the theme of hobbies rather than breakfast foods that had been decided beforehand. They were both able to keep the group focused and on track and used humour to warm up the group and help them to feel relaxed and at ease. The meeting ran well and all items on the agenda were achieved and covered. When asked if the two young chairs had done a good job it was thumbs up all round. Daniel said "it made me feel quite important, like I was in charge of a meetings. It was an enjoyable experience and I think it might help people when they have discussions about things. I would recommend it to my friends to do it". Daniel John, the trainer, was very proud with what the two young Chair persons had acheived and said "They stayed focused and never let their minds wander, they found that their confidence had increased after the training. Both chairs made sure that they were well organised before the meeting started, they remained calm when the group became difficult and adjusted appropriately to the situation, bringing the group back on track. Overall I was extremely impressed with both chairs as they showed initiative and remembered all the training that they had received that enabled them to achieve all meeting objectives." The training was a real success and saw both Adam and Daniel take away new skills and confidence and the knowledge that they can reach for the stars and try new things. Well done! Newer PostIntroducing our amazing ambassador Nikki Stargazer. Older PostWhat difference does a diagnosis make? Let's find out from SWAN and the parent of a child without one.